A lot of people feel most comfortable sleeping on their stomachs. While this may seem like the best sleeping position especially for sleep apnea patients, some chiropractors say otherwise. In fact, it is regarded by some as one of the worst sleeping positions because it can incur damage not just to your posture but also to the alignment of your spine. Sleeping on your stomach can cause neck sprain because you tend to tilt your neck when you rest your head on top of the pillow. This is said to create spine rotation which can precipitate or aggravate chronic neck and back pain. If you prefer this type of sleeping, making sure you have the right mattress will keep your neck in its best position to help reduce back pain and compression. What Should You Know about Stomach Sleeping? 1. Who is More Likely to Sleep on Their Stomach? Stomach sleepers as a rule can’t be defined by any specific criteria. Some people just enjoy it mainly because it’s a cozy and comfortable position. Although it is not a very healthy option, many individuals find it the most comfortable of all. Shifting into this position helps individuals sleep better because for some this is a very comfortable position. The “prone” position may not really affect healthy individuals but could provide some discomfort to those who have pre-existing chronic or severe back pain as it puts much strain on the back ligaments. With this particular sleeping position, the entire weight can put pressure on the torso which can result in back pain especially in the lumbar region or lower back area. With spine misalignment, this can result in pinched nerves and herniated discs which is a serious and debilitating condition. Individuals with existing back pain will most likely want to avoid this way of sleeping for this reason. Even though chiropractors and sleep therapists do not recommend this sleeping position to patients with lingering back pain, this is said to be beneficial to patients that suffer from sleep apnea and digestive problems. Sleeping on your stomach also helps reduce snoring and prevents heartburn. There is a reason why many people prefer to sleep on their tummies – it is comfortable. Well, not everything that makes us feel good is right for our body or even healthy. These people could be putting their neck and spine at risk but there is a way to alleviate these symptoms – a new mattress fits for individuals who sleep in their stomach. Proper Support for Your Back – Like we already said, back support is the biggest concern for these individuals. Therefore, the first thing you need to do when shopping for a new model is to know which type will provide the most support for your back. Models that come with a conforming property are the best. Memory foam is widely known for its ability to contour to the body’s curves and relieve pressure points as well as back pain while being very supportive. Medium to Slightly Firmer Level of Firmness – The idea is to get a model that is not too soft that can cause your pelvis to sink down, putting more pressure on the spine. This will then result in pain in the morning. A good option for stomach sleepers should be on the slightly firmer side, but not too firm as it will cause you spine to fall in an unnatural position. Consequently, it can cause pain when you wake up. Flatter Pillows – When you sleep on your stomach, there is less space between the mattress and your profile. A thick pillow can elevate your head too much despite your bodying laying so flat against the surface. The unnatural position can result in more pressure or even spinal misalignment in your neck. Slide a Pillow under Your Pelvis and Hip Area – This is another way to take pressure of off your spine, allowing it to stay in its natural position. Change Your Sleeping Position – Yes! Stomach sleeping is not healthy and definitely not recommended for those who have back pain. This can be done with the help of a body pillow or side pillows, giving you a sense of sleeping on your stomach. If you are either a back sleeper or stomach sleeper, then you’re in luck with this memory foam product that lets you enjoy both worlds. You can get it for a very affordable price, especially with our $125 off coupon. The Nectar is made up of 4 layers of foam and with a Tencel top cover that keeps your sleeping area breathable, cool, and bug-resistant. It uses semi-open LUSH foam that gives that extra softness, loft, and breathability as it does a great job in heat absorption and redistribution. It features intuitive memory foam that provides a cool top layer and draws heat away from the body. The bottom layer is designed to be thicker so as to provide adequate compression and support. The Nectar is aesthetically pleasing and provides the classic memory foam feel, along with great support and contour but with the softness of a pillow top. What’s great about the Nectar is that it provides medium firmness which has just enough bounce that you feel cradled but not necessarily enveloped. This helps relieve pressure while supporting the lumbar area, and is perfect when sleeping on your stomach as well. It comes in a universal comfort model which we rate as a 6-7 on the firmness scale (10 being firmest), and it provides good support, pressure relief, as well as great comfort for all sleeping styles. Mattresses that are too soft are not tailor-fit for stomach sleepers. Sinking into them is a no-no because it can harm the spine and cause misalignment. 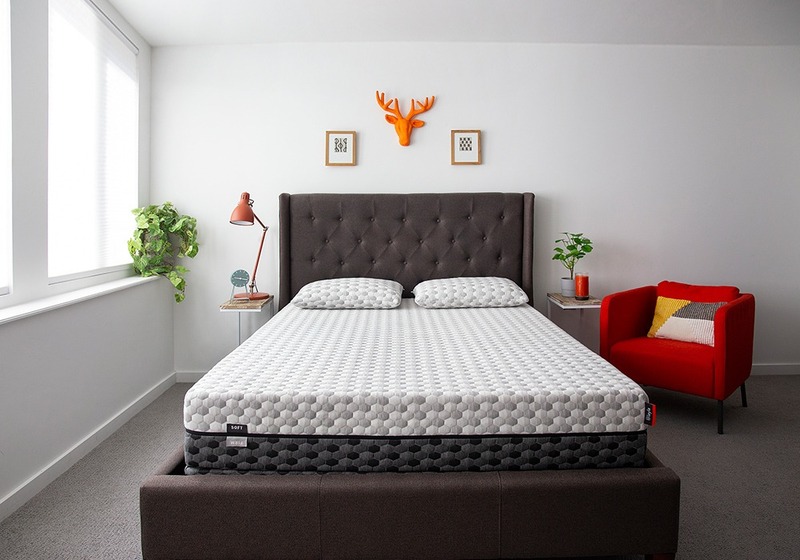 What makes Layla stand out among its competitors is the fact that it is one of the first memory foam mattress that has two sides with different firmness’ that can be interchanged depending on your needs. It features the ThermoGEL technology and copper-infused memory foam which ensures you a cool sleeping surface with good airflow. Stomach sleepers would usually want to be on the firmer side of the bed. It is one of the best mattresses not only for stomach sleepers but also for side sleepers. The comfort layers that are infused with copper are designed to help relieve joint pain and inflammation while improving blood circulation, which is great for all sleeping styles, but it is the best for stomach sleeping especially.